Once upon a time there were two friends, Michael and Armin. They played tennis together and sang and made wine out of the renowned Müllheim grapes. But one day they started running in the Oak Forest of Müllheim, exploring the countless paths and roads of the Eichwald. They enjoyed it immensely, particularly afterwards when they could relax and brag about their feats. Michael always provided something good to eat and drink. Not much later Christoph and Heiner joined the informal runs. Now there were new paths to follow. 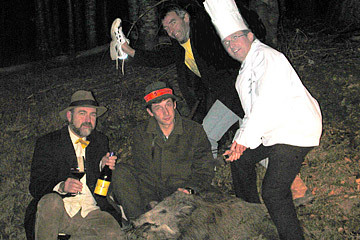 For instance up to Christoph's hunting lodge where they could enjoy specialities like wild boar and the house wine: "Lords of the Gravy Train" - a noble Pinot Noir from the Römerberg of Badenweiler. The first "Genusslauf" saw 10 participants. Start and finish was at Armin's house. The course was approximately what is now our half-marathon. Christoph had the idea that a real Genusslauf would attract even more runners. And thus the "Genussläufer Dreyeckland" association was born with the goal of holding a half- or quarter-marathon every year in the vinyards of Müllheim. The first official Genusslauf in 2001 was a great success with 273 particpants. The numbers grew and grew every year so that it was finally necessary to limit the number of runners to 1200 in order to guarantee the quality of the Genusslauf.